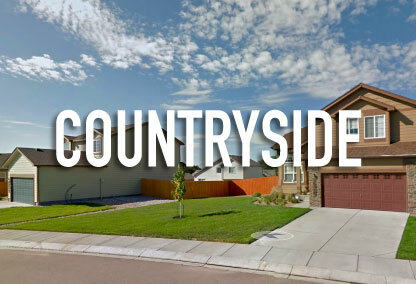 Countryside is a popular neighborhood in Fountain, CO, located right off of Link Road and Jimmy Camp Road, near Fort Carson High School. The Countryside Townhomes are also a part of this community. They are located North of the neighborhood on Countryside Grove. The townhomes were built in 2005 with two green spaces designated for the community. Countryside is located only a minute from John Metcalf Park, which has equestrian riding areas, a skate park, multiple playgrounds, and open fields for sporting events. Most of the homes for sale in Countryside are between 1,200 to 3,500 square feet in size and were built from the 1980s to now. Sections of Countryside are currently under development with new homes still being built. Countryside does not have a mandatory Homeowners Association at this time. The Countryside Townhomes do have an HOA though. They are managed by Priority Property Management. This neighborhood is zoned to Fountain School District 8 with Jordahl Elementary, Fountain Middle School, and Fort Carson High School as the primary schools for the kids in the community. Countryside is considered to be part of the Fountain MLS area within zip code 80817.